As of the day of writing this document (2019-02-03), the feed contains 203.9K malicious domains. These domains are retrieved from the zone files of multiple top level domains (.bid, .click, .date, .download, .fun, .host, .icu, .link, .loan, .men, .online, .party, .pro, .racing, .review, .site, .space, .stream, .tech, .top, .trade, .website, .win, .works, .xyz, and .zip) available via the Centralized Zone Data service (https://czds.icann.org/en). How to use the feed? The feed is available for non-commercial use and without warranty. It may be used for any activity ranging from live detection or threat hunting to AI/ML. We encourage users to check whether the correlation of the PatternEx feed with the network traffic logs of their organization results in malicious findings missed by existing organizational security defenses. 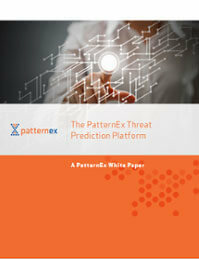 We would love to hear your success (or failure) stories (threatex@patternex.com)! How is it different from other feeds? In a nutshell, we identify many domains weeks before they are reported in any other blacklist. To back this claim, we presented a comparative analysis in a peer-reviewed paper at the IEEE BigData conference in December 2018 (https://ieeexplore.ieee.org/document/8622197). We look forward to expanding the feed by either analyzing other open data sources, or by detecting other categories of malicious domains. Either way, if you would like to contribute to this project please do get in touch (threatex@patternex.com). In the the next blog of the domain detection series, we will provide details of the deep learning model used to generate the feed. Please keep posted for updates and don’t hesitate to share any success or failure stories using the feed!